We’ve flown in to Phoenix and our first impression of Arizona is a 2 hour, star-soaked-sky drive into the mountains! The temperatures fall lower and lower as we inch upward toward the wonderful town that will be our weekend home. 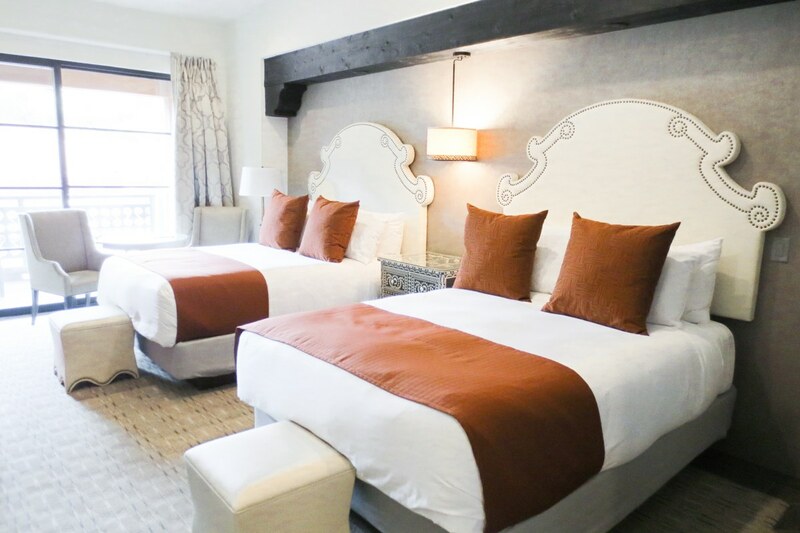 When we finally arrive, we’re escorted to the beautiful new rooms at Sedona Rouge Hotel and we snuggle under the crisp white sheets and dream of the wonders that are sure to show themselves in Sedona! The sun peeks through the curtains and I’m lured out onto the patio of our room… My Girls Getaway pals don’t love my early-morning-stirrings, but they know I’ll get a great photo of our lovely view, so I don’t hear too much grumbling! 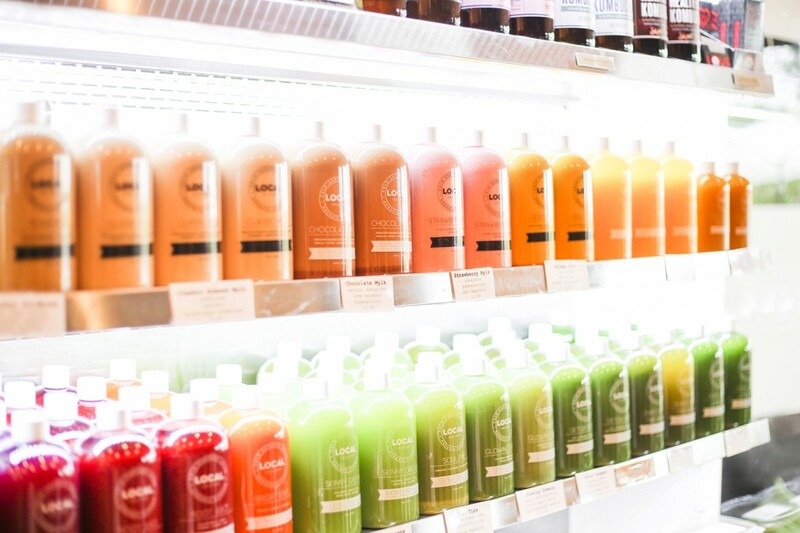 To jump start our first day, we’re off to a place that honestly sounded too good to be true: Local Juicery. Tasha promises it will be healthy AND tasty. For me, these two don’t generally fit in the same sentence… Boy o’ boy am I wrong that health food cannot be both! I will go broke (and possibly also get fat?!) 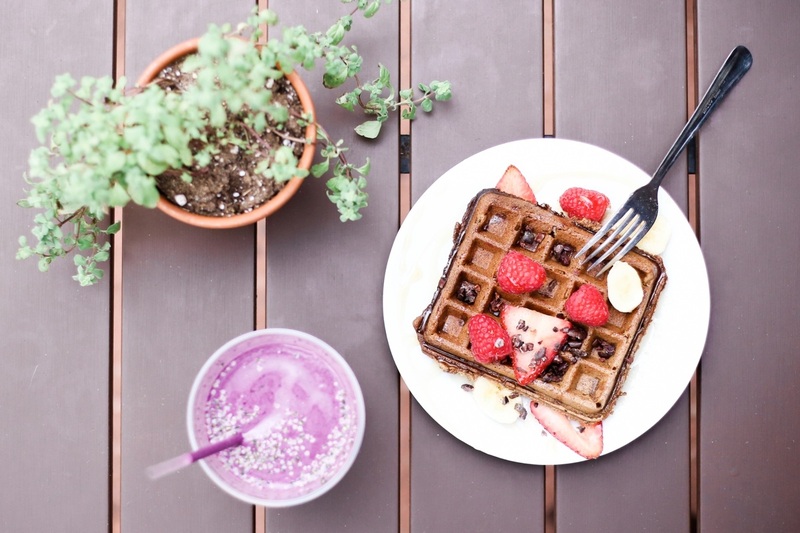 on gluten free waffles (with bananas, strawberries, cacao nibs and honey), PB&J Vibes vegan smoothies, and avocado toast if miss Summer Sanders expands (as many have begged) and opens up shop in other cities! 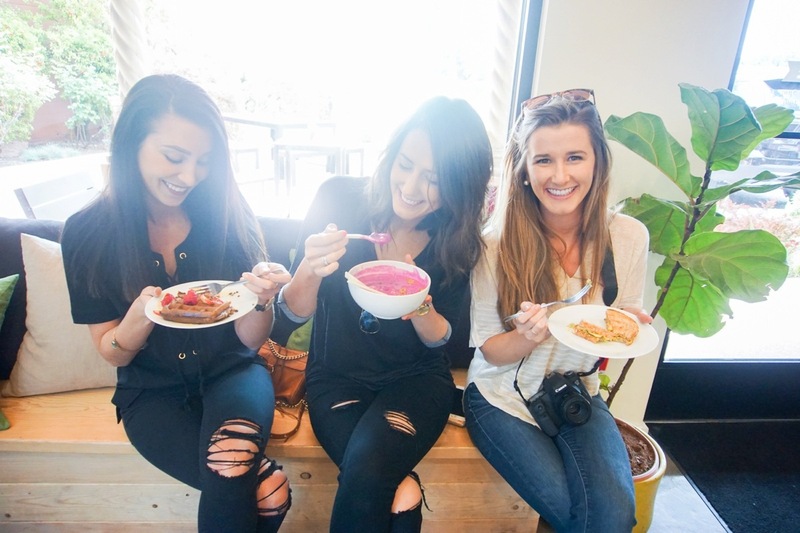 Chowing on healthy grub, meeting the brilliant proprietor of this genius juicery and laughing with Jess and T is the perfect start to our Sedona Girls Getaway! As if we haven’t had enough to eat… we’re off to snag some Tamales – when locals give you secret tips on where to go and grub, you can’t pass them up… no matter how full you are! Though Tamaliza Market is but a little kitchen, the menu hosts only 4 – 6 items and it’s not exactly what you’d call “instagrammable”… it is WELL worth the visit! Some places are meant to be savored and not captured, so upon receiving our plates from Claudia (the friendly owner and chef whose family recipes are served here), I snap a quick iPhone shot and we all dig in. These are my first Tamales, yep – ever, and T assures me I won’t find many better! 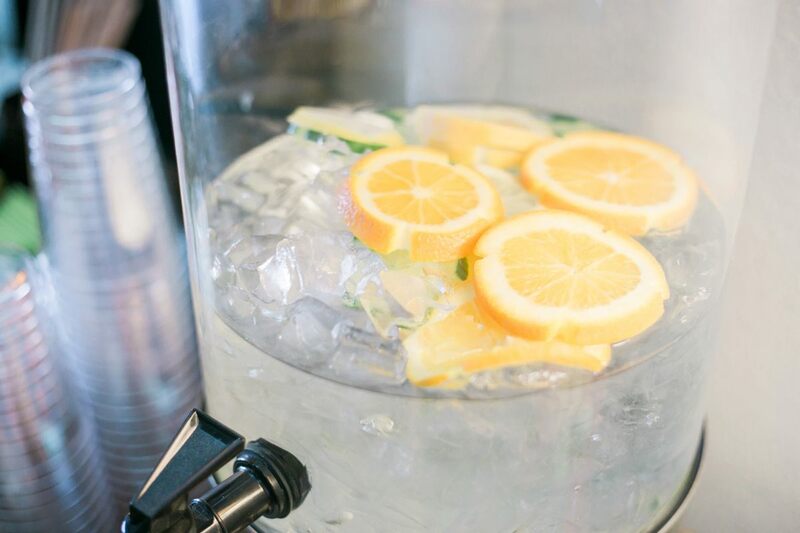 She even asks if she can get some of these bad boys frozen to take home with her, but is informed they make them fresh each day and don’t freeze them! 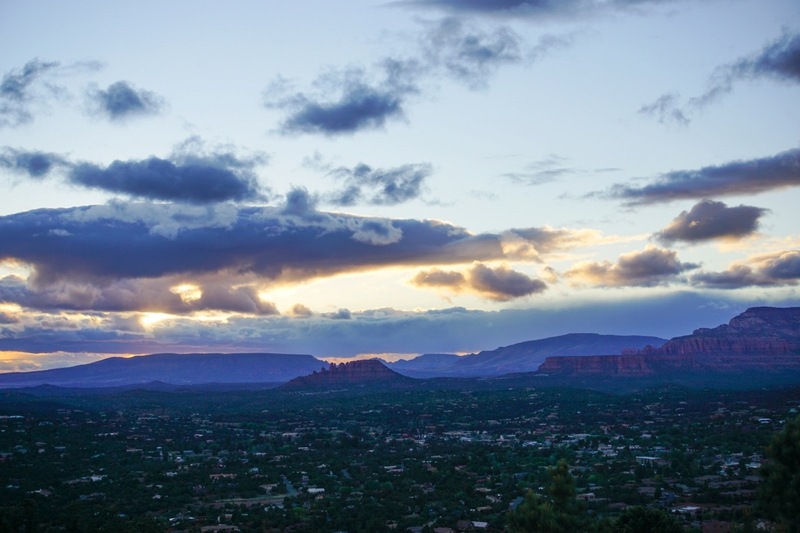 This is a true taste of Sedona and I’m so glad it was suggested, as we surely would have missed it. 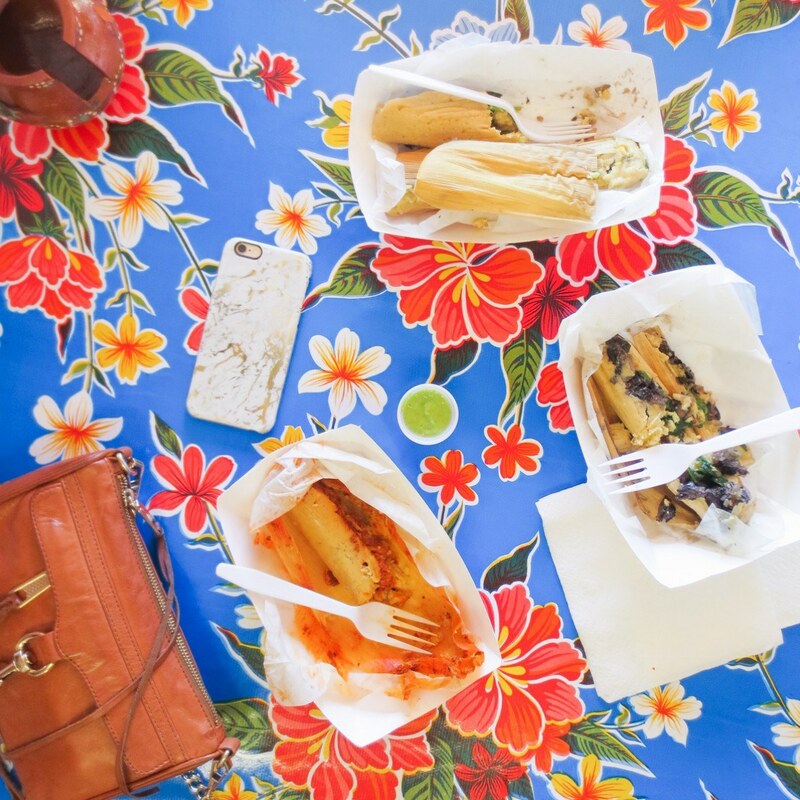 Put this spot on your list for lunch, grab a few tamales to go and find a shady spot to enjoy! 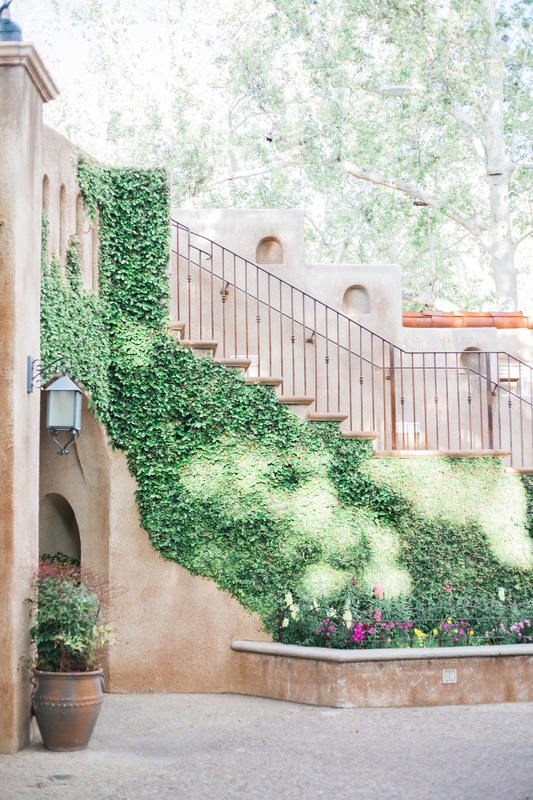 We walk through an arched entryway and ahead of us is an ivy covered wall, to the right a beautiful, trickling fountain and to the left is The Secret Garden Cafe (where we escape the Arizona sun, dipping in to grab a glass of local vino). 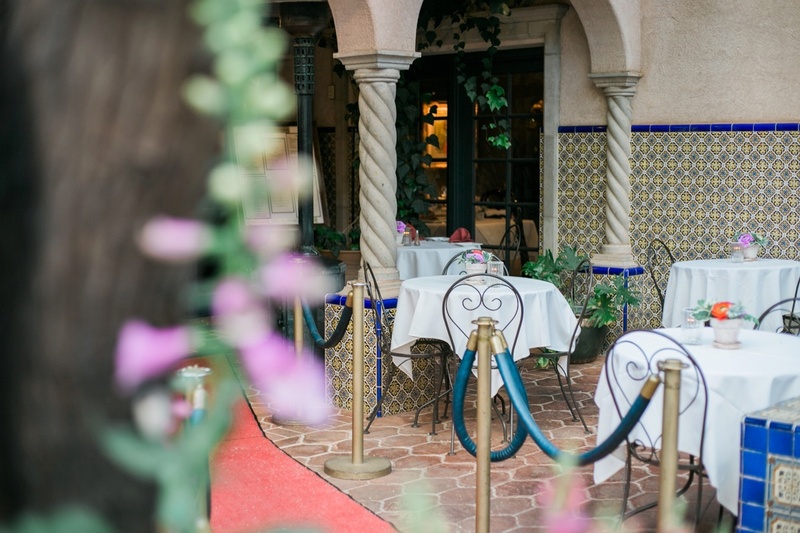 Tlaquepaque is an absurdly charming shopping and arts destination. 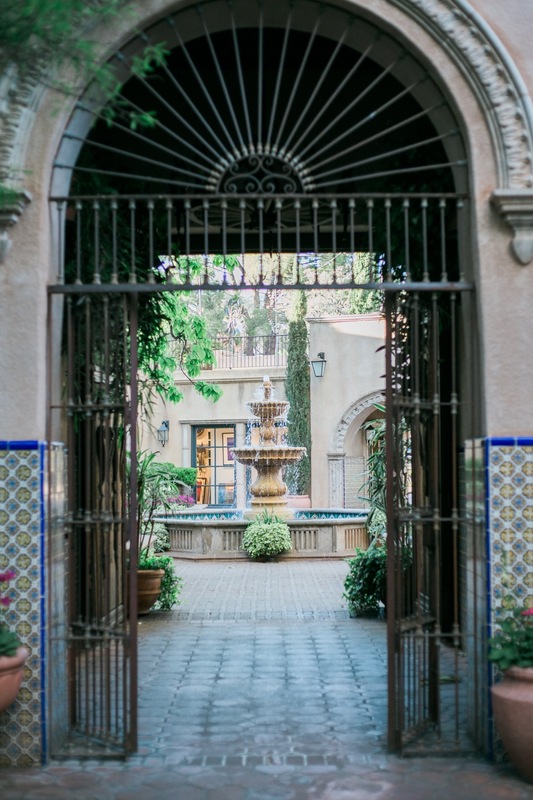 Situated like a little town, there’s something unique and lovely around every corner and in each of the four stunning courtyards! 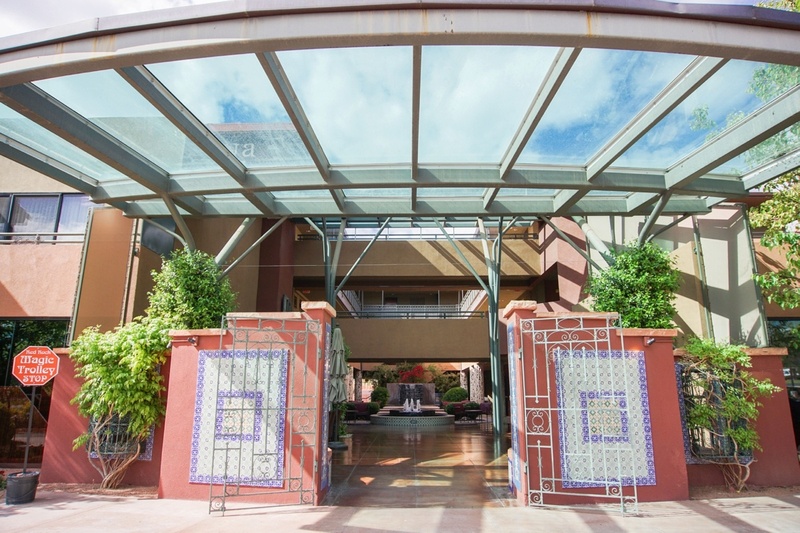 Fountains, painted tiles, flourishing greens and vibrant flowers set against the lovely, Mexican-inspired architecture create a delightful ambiance for relaxing and exploring! 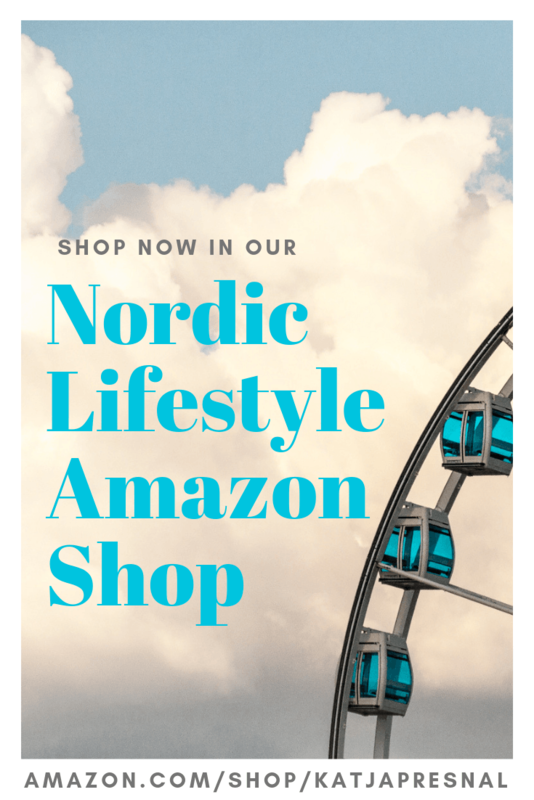 We meander through jewelry shops and art galleries… and while many items sold here are high end, nothing is mass produced – it’s a wonderful spot to look for one-of-a-kind pieces! It’s been all food and laugher up until this point and it’s time to dig into some scenery and history to satisfy our thirst for knowledge and sights! Stop #1? 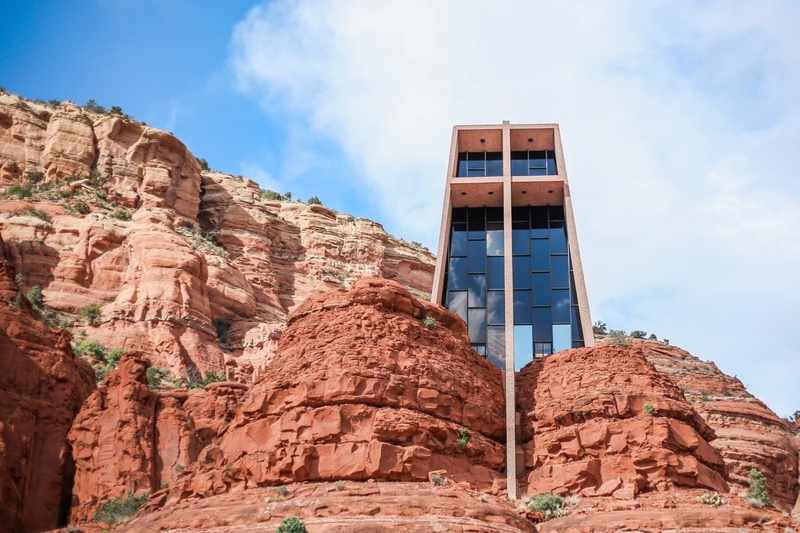 Chapel of the Holy Cross… a striking piece of holy architecture jutting forth from the rugged red rocks… I’ve been itching to lay my eyes on this iconic spot since booked our flights! There’s decent parking, we luck out with a nearby spot and meander uphill against the increasing wind. 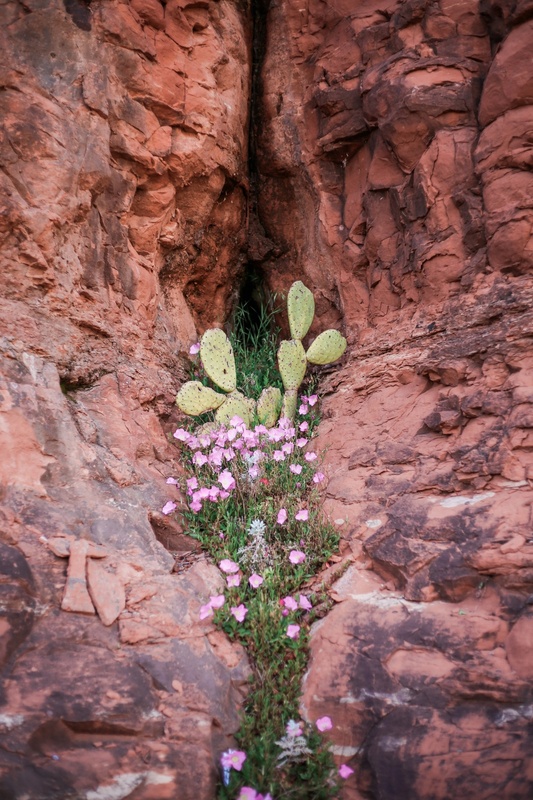 Passing various species of cacti and beautiful wild flowers growing in the cracks of the stone, we notice the crowds are greater here than we’ve seen thus far, this is a popular spot and you can see why. This remarkable structure was built in 1956, it’s design is an inspired vision of Brunswig Staude (she studied under icon Frank Lloyd Wright!). The cross stands 90 feet tall (on top of the 200 feet of rock it sits upon) and the panoramic view from the inside is just as magnanimous as that from here! This is far and away the most unique Catholic structure I’ve encountered! We’d love to linger longer, but we have dinner plans with renowned chef, Lisa Dahl – and when she invites you to dine with her, the answer is yes! 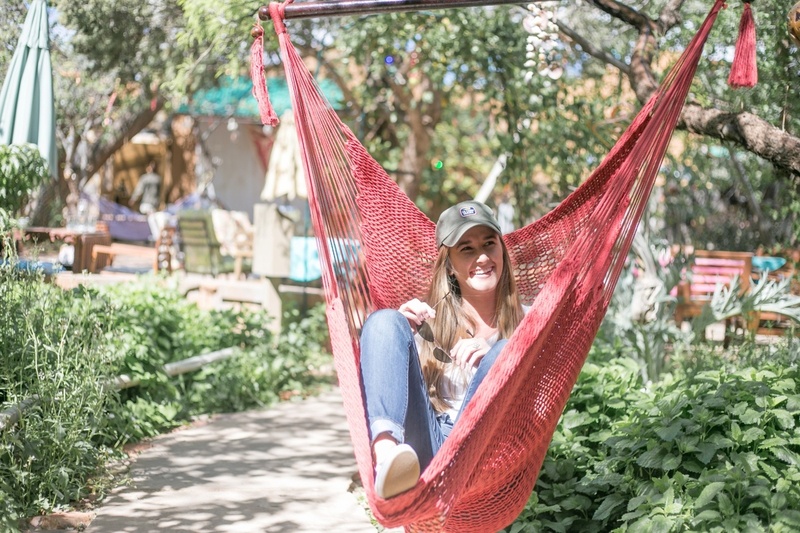 After our leisurely first day we head in to freshen up – if there is a place in town that warrants dressing up a bit, it’s Sedona’s favorite restaurant: Mariposa Latin Inspired Grill. Home to incomparable vistas and to the tastiest menu in town, this place is on the DO NOT MISS IT list!!! As we settle in, we spot Lisa, she’s making her rounds, glowing with pride and care as she chats with her beloved guests. She makes her way to us and a bottle of sparkling Malbec follows (this wine is a new one for me, and what a treat!) From the moment we’re graced with this eclectic woman’s presence, the table is full and the conversation and wine are ever-flowing! 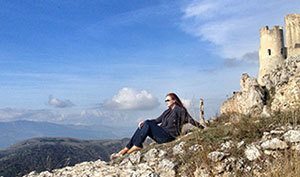 Lisa regales us with tales of her travels, the inspiration behind her dishes and the life experience that’s lead her to where she sits right now. We chat, we eat, we drink: South American influenced Fried Avocados with a smokey, pimento, lemon & Peruvian pepper aioli… Roasted Portobello Quesadillas (perfection) with spicy jack cheese and charred corn… Mom’s Favorite Au Gratin Potatoes… “Veggie Nirvana” Stuffed Poblanos… perfectly prepared Filets with Mushroom Gorgonzola Chipotle… and last, but certainly not least, the house-made Empanadas with Pineapple and Chimi Churri – which we were instructed to cut open and fill with the toppings! Need I even say it?? 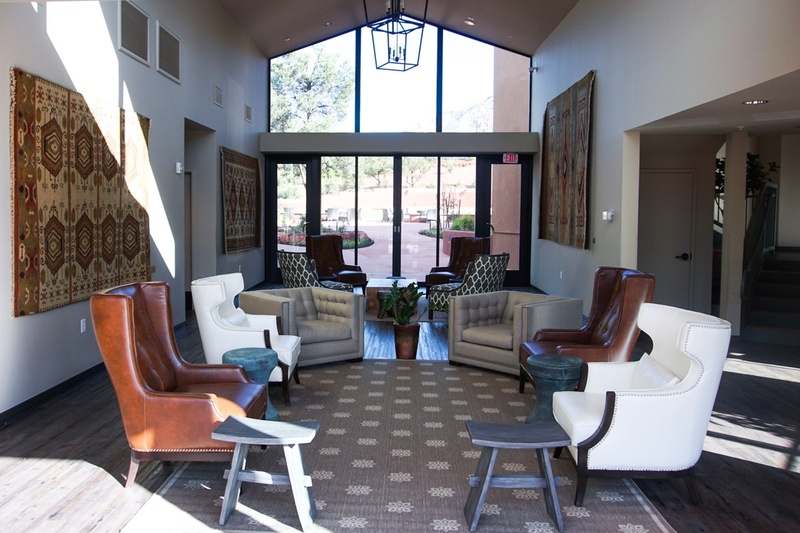 Don’t miss Mariposa when you visit Sedona. Just don’t. We vow to return tomorrow for (more wine) and to experience the views, and we find our way home, to our dreamy hotel, for a good nights rest. Our second day begins with a little romp around the resort grounds and a photoshoot for one of our favorite fashion brands, Tresics! 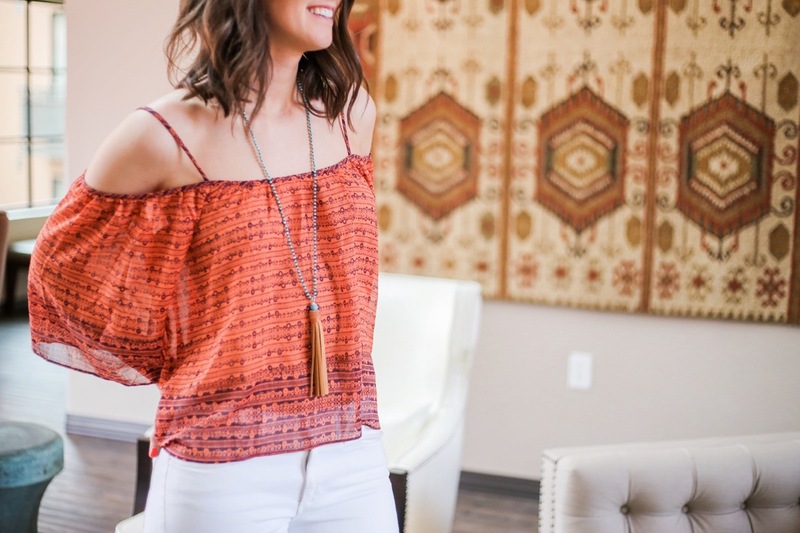 We’ve all packed a few items from them for this adventure because they’re comfy, they pack well and they can be dressed up or down… Plus, we’ve noticed they seem to pair perfectly with our newest jewelry obsession: the Enjoy Life Diffuser Collection! 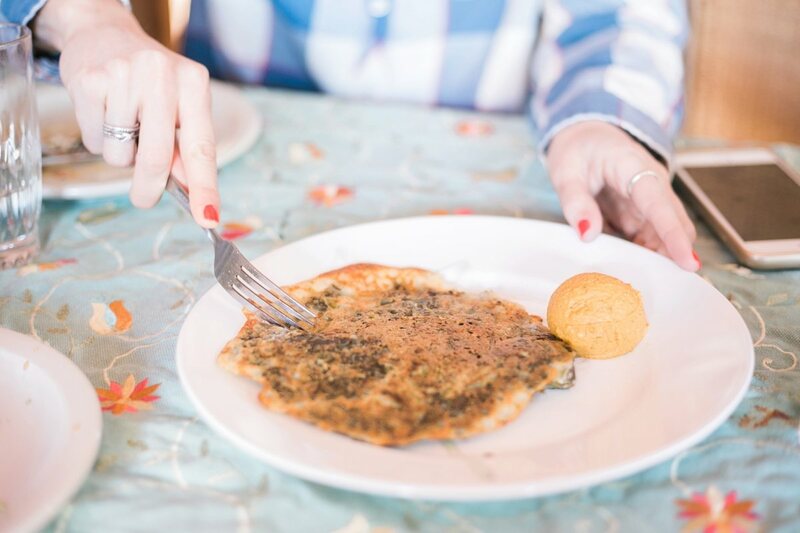 After strutting our stuff for photos all around Sedona Rouge, we’re on to breakfast at REDS, where chef Ron Moler brings authenticity to the kitchen using inspiration and skills learned from his mother and grandmother! The fare here is “gourmet comfort food” and is a true treat from the Chorizo Scramble to the Huevos Rancheros! 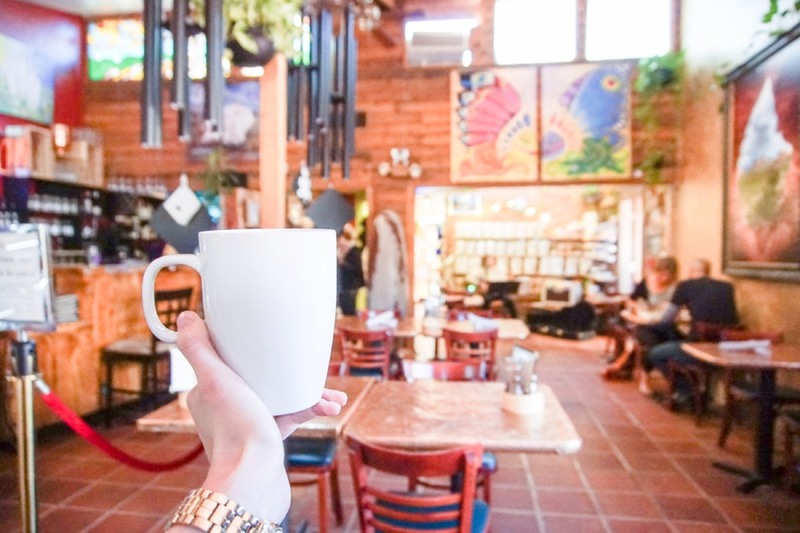 Our waitress is energetic and fun, and returns quickly with our morning fuel & food! 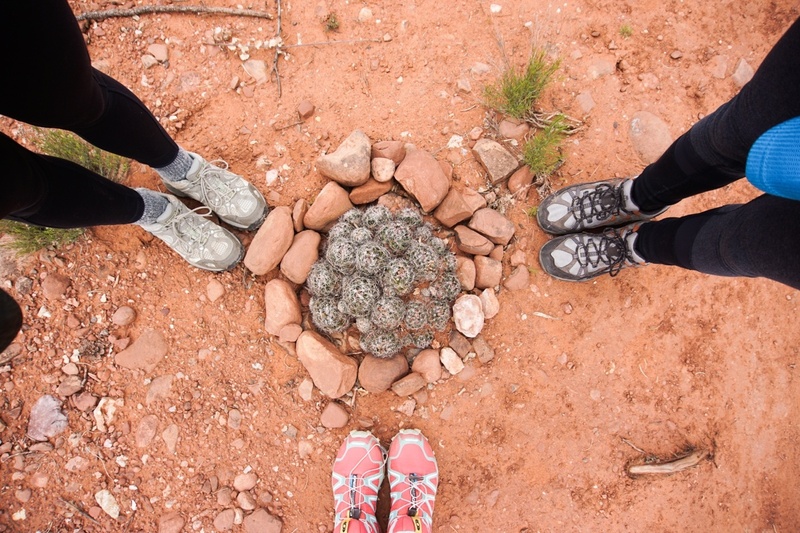 Our brains and bellies are now happy campers and we’re in for some red rock adventures!! 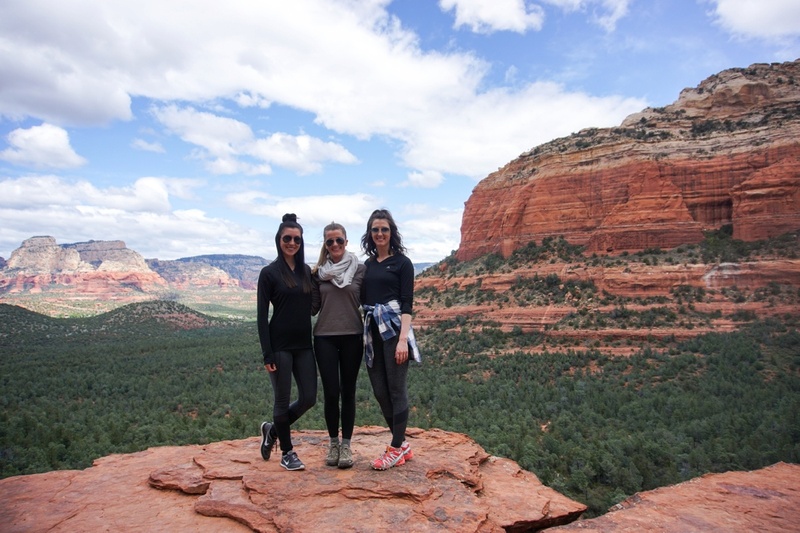 Devil’s Bridge Trail was top on our Sedona Girls Getaway to-do list and we’re making that happen this morning! It’s a bit difficult to judge what to wear as it’s hot yet cold here… and we know it’s sure to be windy the higher we climb. We layer up (probably a bit too much – I’m quickly stuffing my jacket into my tiny backpack) and head out! Miss Jess hasn’t hiked before, but she’s pretty tough – so, while we could have taken the super short route (2 miles roundtrip) or we could have opted for the longest (8 miles RT… but the first/last two are flat and boring from what I understand), we’re settling right in the middle: 2 miles up and 2 miles back. The winds grow wickedly strong as we progress along the well beaten path to Devil’s Bridge… and though you can tell many feet have trodden this way, it’s a quiet, tranquil, remarkably beautiful and seemingly desolate hike this morning. As we near the end of the trail it grows suddenly steep, so be forewarned. You can do it, don’t worry – but be very mindful that if there has been any rain this could be a tricky spot. 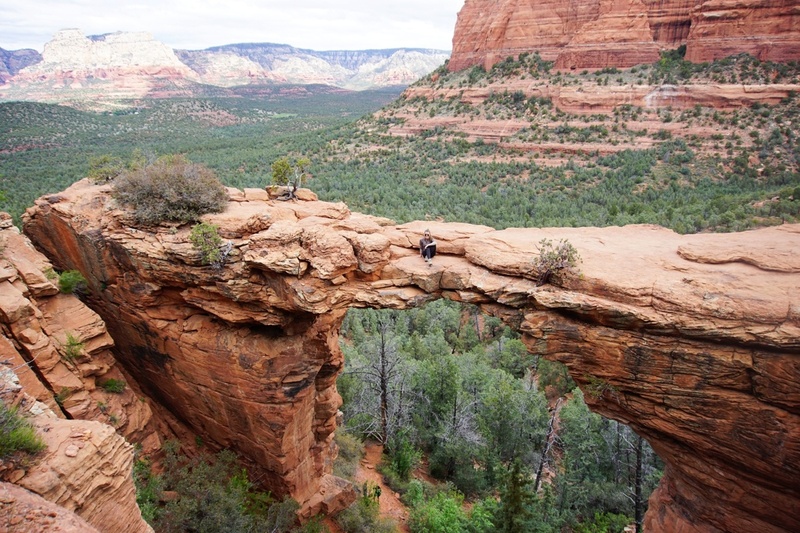 We reach the top, a bit out of breath from both the climb and the dramatic view we now have of Devil’s Bridge. The natural sandstone formation looks treacherous from where we stand, but I’m dead (pun intended) set on walking across it! Tasha (the most practical of the group – she is an engineer after all), is hesitant to say the least. She crosses her arms and states, “I wouldn’t build it. So I won’t walk on it.” As we approach though, her adventurous spirit takes over and she’s just as game as Jess and I, and the three of us take turns waltzing out and having our photo taken! The sun is out and the sky is blue, but the temperature up here in the mountains is brisk! 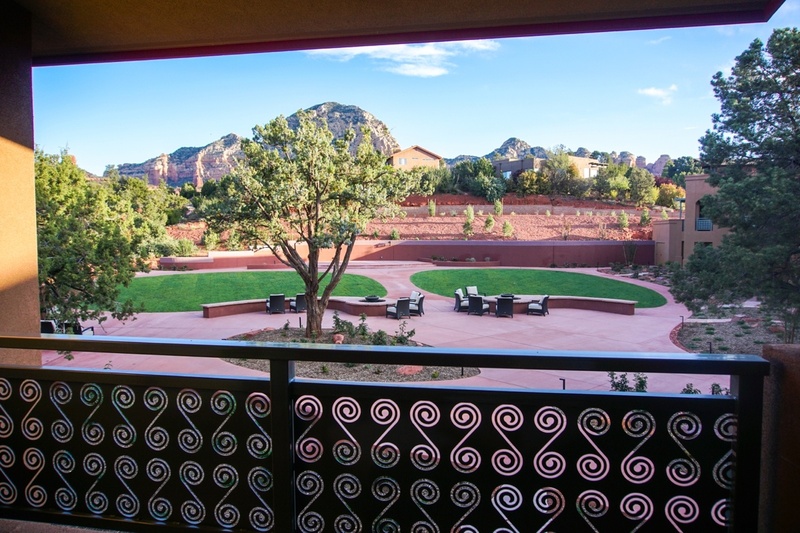 We take an afternoon dip in the Sedona Rouge hot tub, it’s an idyllic setting as this spa is situated away from the pool and with the beautiful red rocks in view. Relaxed, we head just a few steps back to our gorgeous room and get ready for our evening out! First stop of the night is Mariposa! Like I mentioned it was already getting dark when we visited and we’ve heard the view is worth another gander! Well, we weren’t mislead… Popping back by for a walk around in the daylight, and another glass of vino on the patio, has been worth our while! 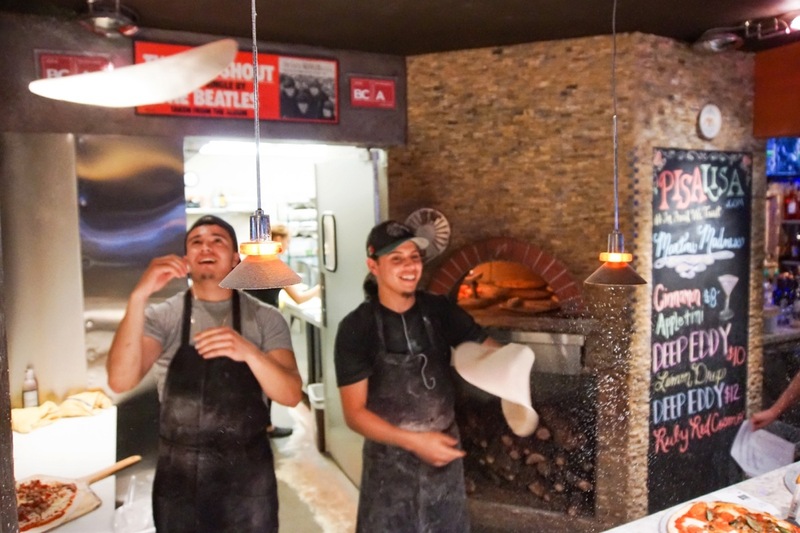 Now, we’re heading out to another of Lisa’s restaurants, Pisa Lisa – where she tells us to be sure to order a wood-fired red sauce pizza and not to miss the Tuscan Tomato Bisque! We’re full (of pizza and tomato bisque… of course!) and we’ve turned in (or so I thought), when T decides we’re going out OUT. Truthfully, I’m not much for “going out” or bars, so she has to drag me… not kicking and screaming, but dragging my feet for sure. News that the spot we’re checking out is within walking distance is alluring and after some poking and prodding, Jessica and I change out of our yoga pants and into some slightly more appropriate clothing, and we all head out. 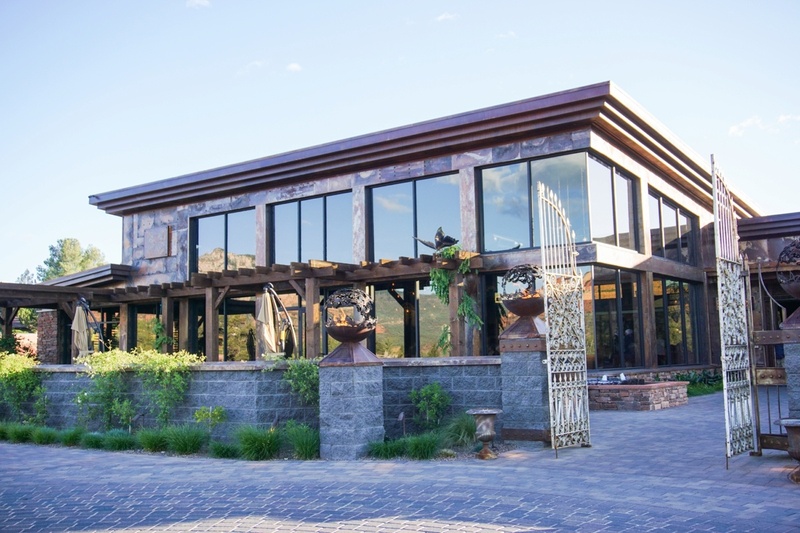 Vino di Sedona: It’s open late and within walking distance of Sedona Rouge. 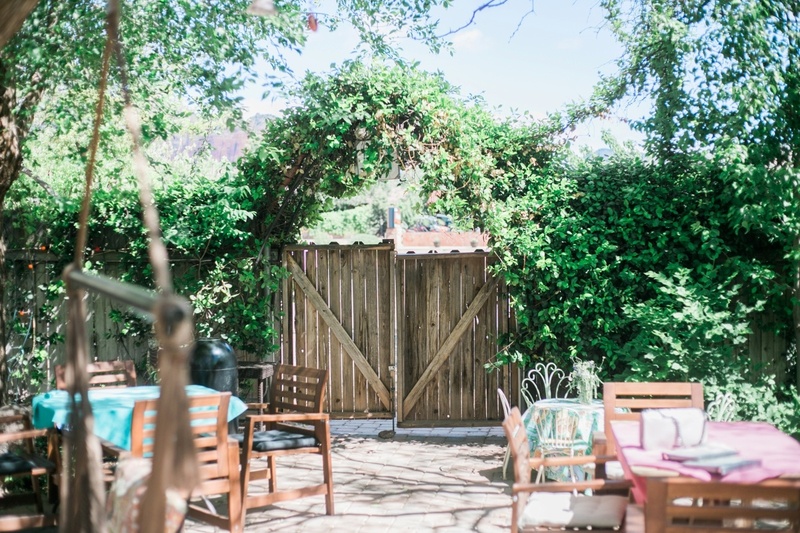 Not only a viable weekend pitstop… but an absolute local Sedona gem! 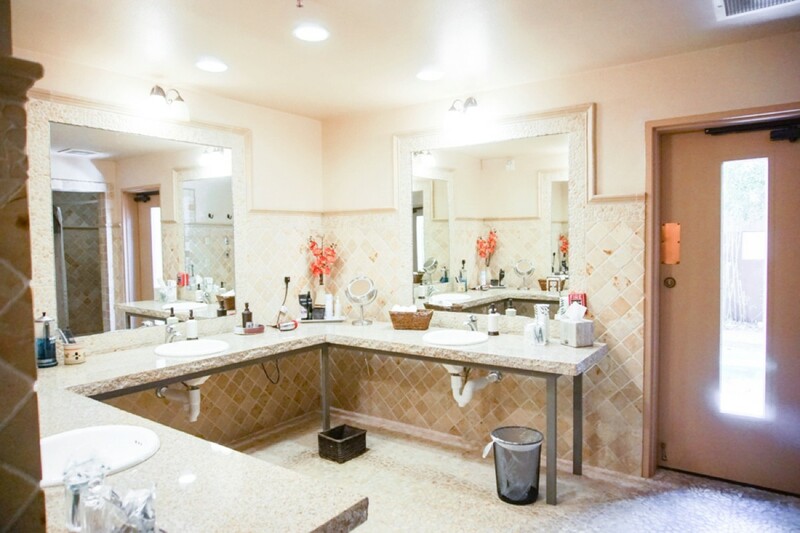 We walk through the doors of an unassuming and seemingly quiet building and are overwhelmed at what we find inside! The place is packed, there large parties at the tables, friends mingling at the bar and couples busting a move on the dance floor! One section of the room is setup like a store or the wine aisle at your favorite liquor store – We snag a bottle (it’s quite a deal!) and a front row seat. This is my kind of night “out”… A laid back ambiance, good wine, live music, a short walk from my weekend home and loads of people watching to do! It seems everyone knows everyone here in Sedona, and now (on only our third night) we’re in the loop too! As he waltzes in the door, dressed sharply in a suit and fedora, JB (he’s the maître d’ at Mariposa, and our newest travel pal) spots us and gives us a wave before he commences to shaking hands and chatting with everyone in the bar area. Before we know it, he’s back – with more vino, an impressive cheese plate and loads of fantastic conversation! We eat, we drink, we chat around the patio fireplace and we cap the night off with a few rounds of darts at Mooney’s Irish Pub. Cheers to a Sedona night out! 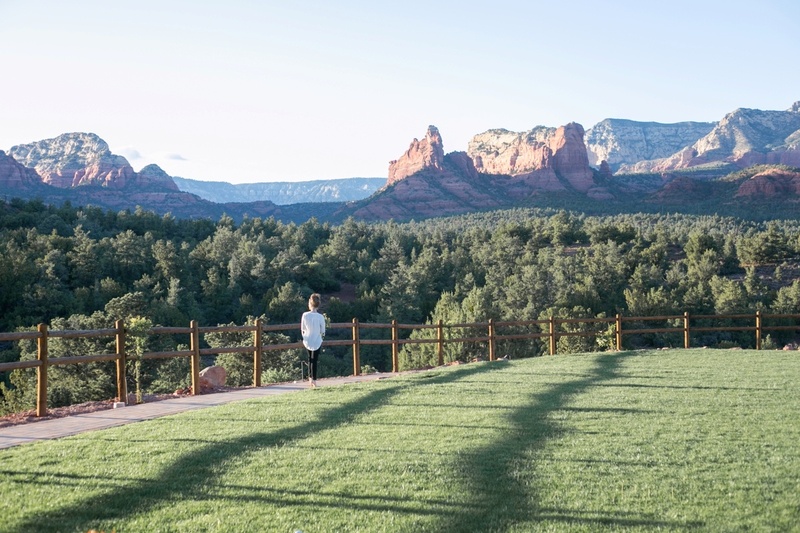 Our third and final day in Sedona, Arizona: The birds are singing as the sun lights up the red rocks behind Sedona Rouge Hotel, and though it was a late evening we’re energetic – ready to embrace our last day in this magical town! There’s no better way to do it than what we have planned. First up? Chocolatree. 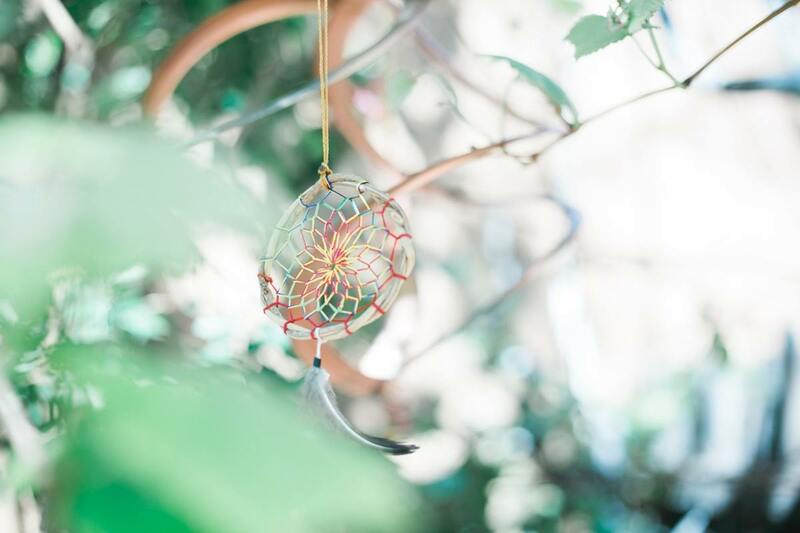 An organic oasis, whose garden is full of wildflowers, fruit trees, dreamcatchers and colorful hammocks, Chocolatree is a wonderfully-weird and marvelously-mystical place. 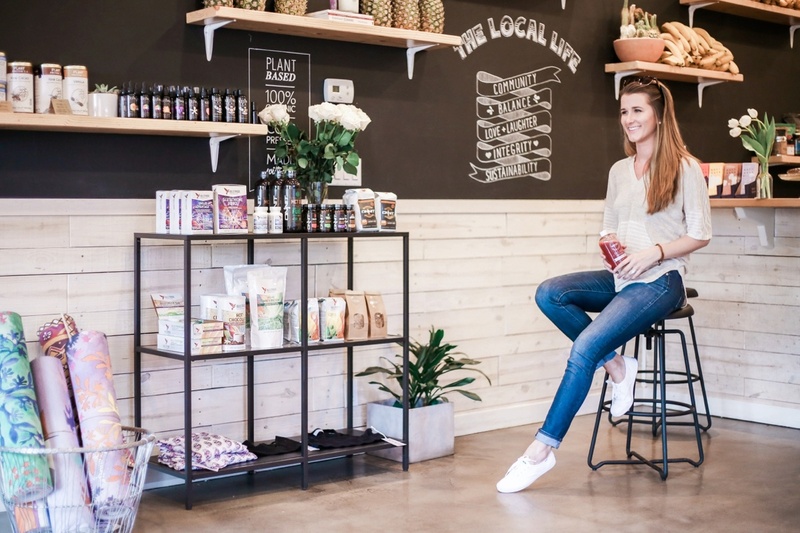 The chocolates are raw, vegan, fair trade and 100% organic… and while this all sounds great on paper, I was worried I might be able to taste all of that mindfulness in my treats! 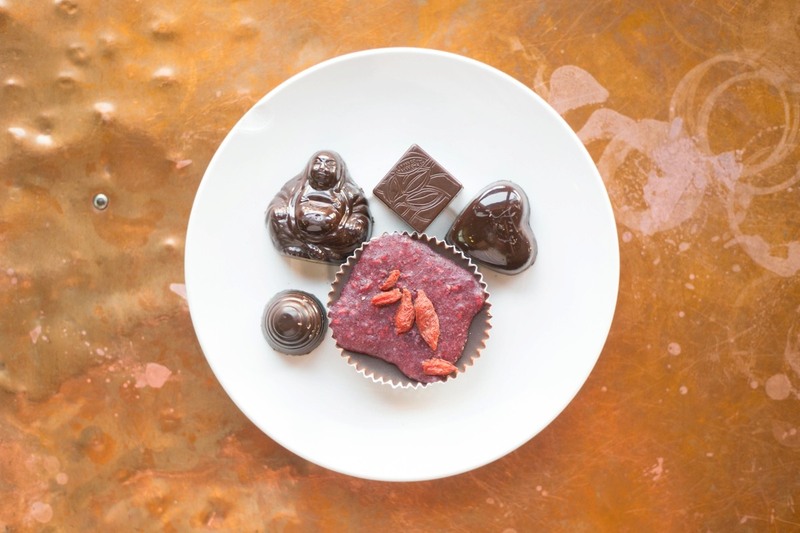 As I pop a square of chocolate with raspberry glaze and a tiny buddha shaped-chocolate into my mouth, my worries melt away. Now, onto the real food (I mean, “Life’s Short, Eat Dessert First” is definitely one of my mottos – but I’m hungry… bring on the grub!). 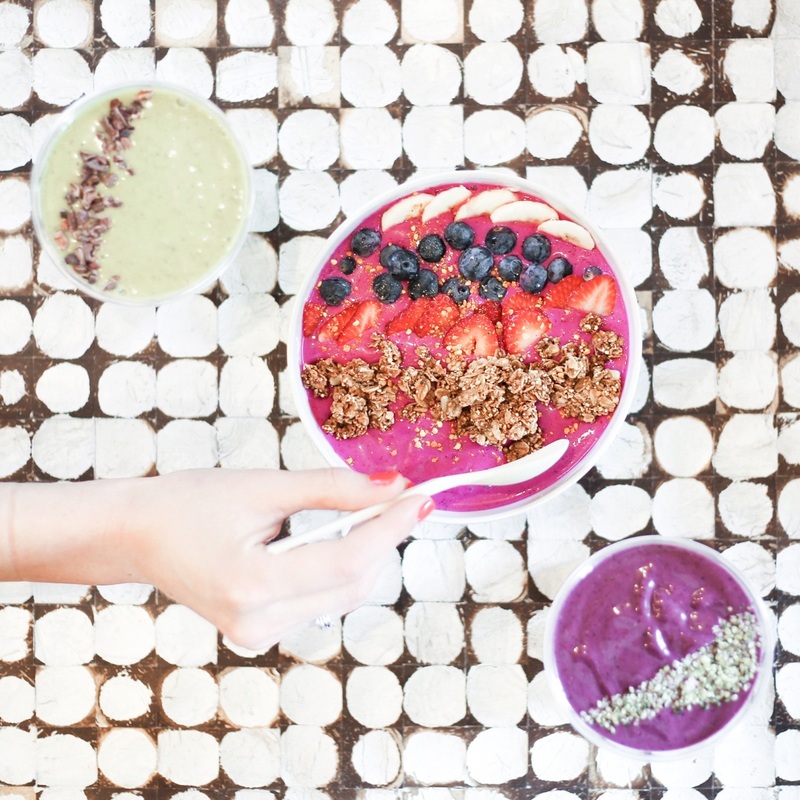 Our waitress is knowledgable, friendly and authentic – she tells us how the foods they’re preparing for us have no grain, no GMOs, no gluten and are truly organic. 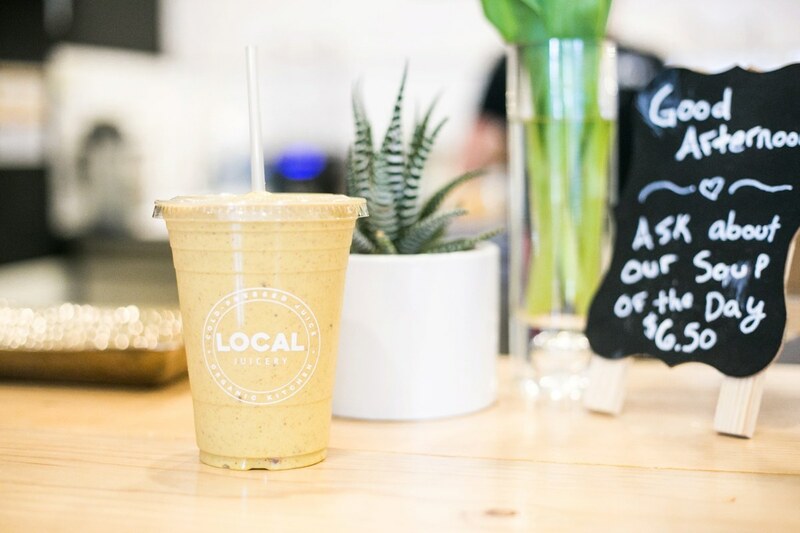 Best of all, 95% of the menu here is seasonal and local – always something new, always something fresh! We take her menu suggestions and she soon returns with goodness in forms from Live Spring Rolls to Palak Uttapam (Indian Pancakes with spinach and curry). 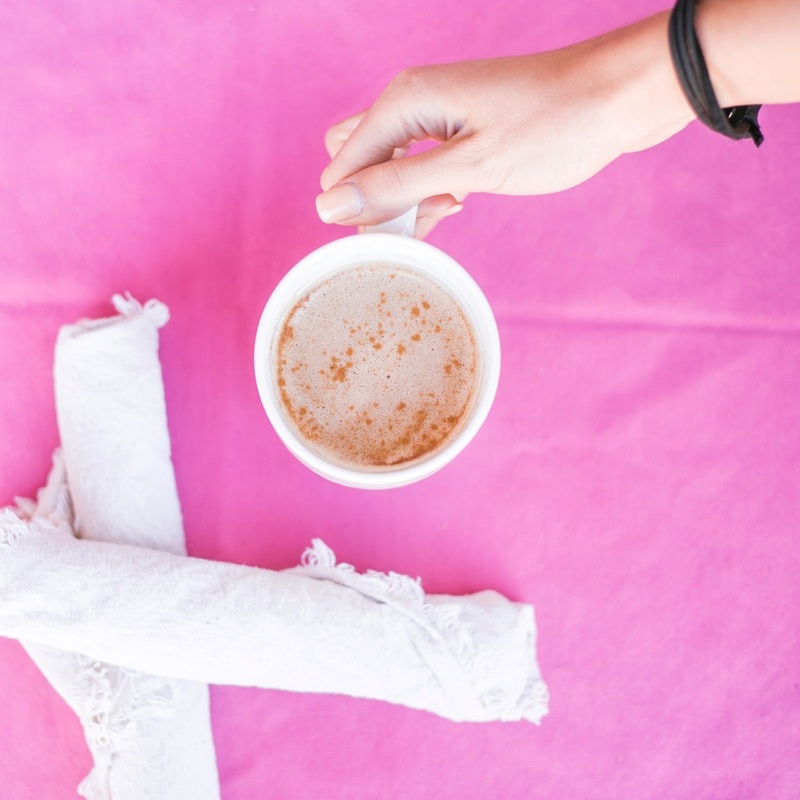 As I sip my frothy drink, the “Heart On” (the recipe to which is literally the length of my arm… it includes but is not limited to ginseng, rhodiola root, maca, snow lotus flower and cayenne!) and attempt to play fair with who gets the last bite of each delectable still left on the plate, a beautiful tune starts up across the room. As we finish our snacks Jenna Hall (an incredibly talented indie/folk singer whose delivery is humble and whose sound makes the music feel effortless) croons covers and originals alike, filling this authentic space with a truly spiritual presence. 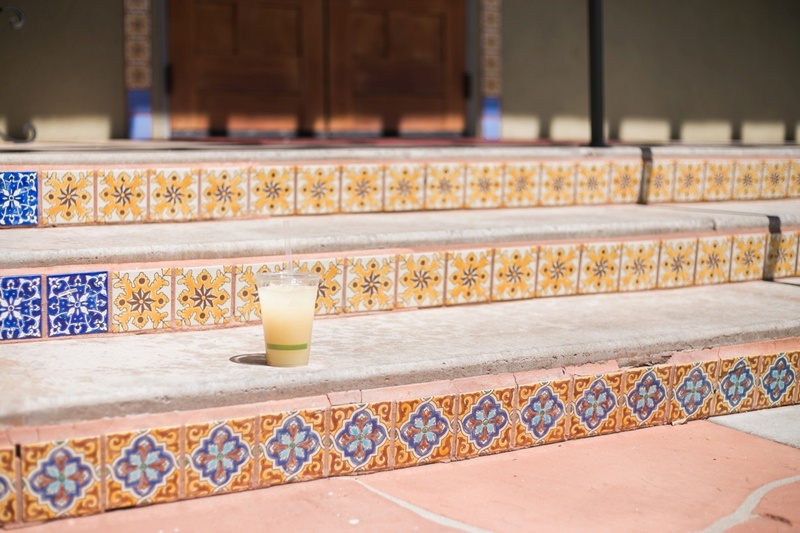 As we’re heading out, our cheery waitress hands us three Ginger Lemonades to-go… “sounds weird”, I think, as I reluctantly put my lips to the straw and sip cautiously. I’m instantaneously in love. This is one of the most interesting and refreshing beverage combinations I’ve ever had and I’m going to slowly sip on this golden delight, sadly knowing it will too soon be gone! 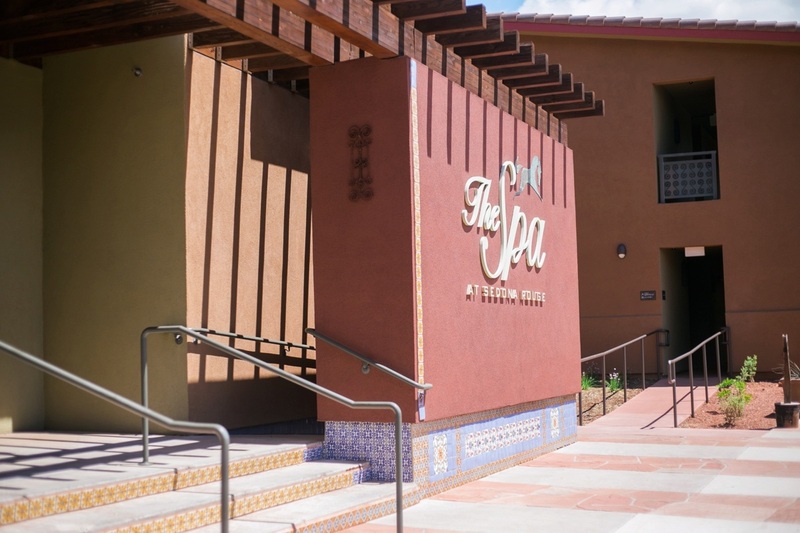 I’m still toting around my favorite new drink as we arrive back at our hotel, this time we’re not heading in to our luxurious room, however… We’re off to experience Sedona Rouge Spa! 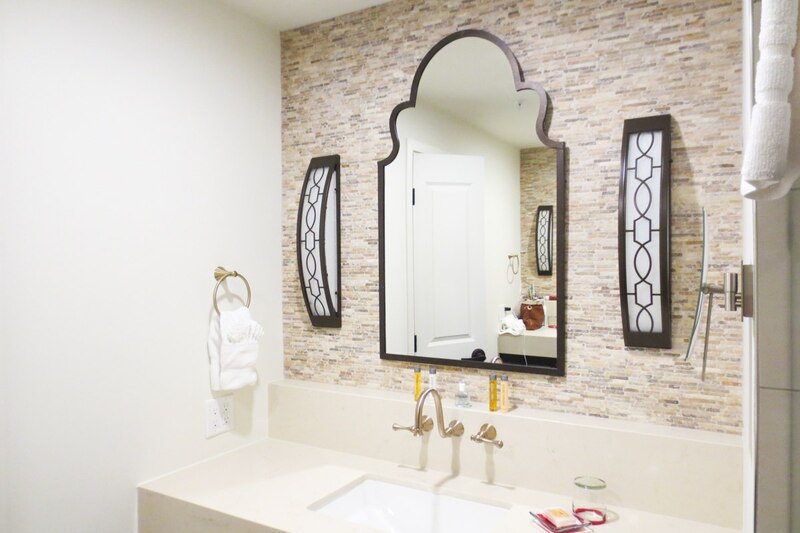 Tasha, Jess and I sign in – we’re on the schedule for hot stone massages – and head to the beautifully appointed changing room where we excitedly slip into our plush linen robes! We spend a little time in the steam room… which I hate. It’s hot (duh) and between not being able to see anything and feeling like I’m suffocating (is this because I have asthma or does everyone feel this way?? Why subject yourself to this torture? Just, why?) I call it quits before my gal pals and I head to the spa hot tub where they soon meet me. T and I submerge while Jess dips her toes in (it’s clothing optional – and we’ve opted to be clothed, in swimwear at least!) 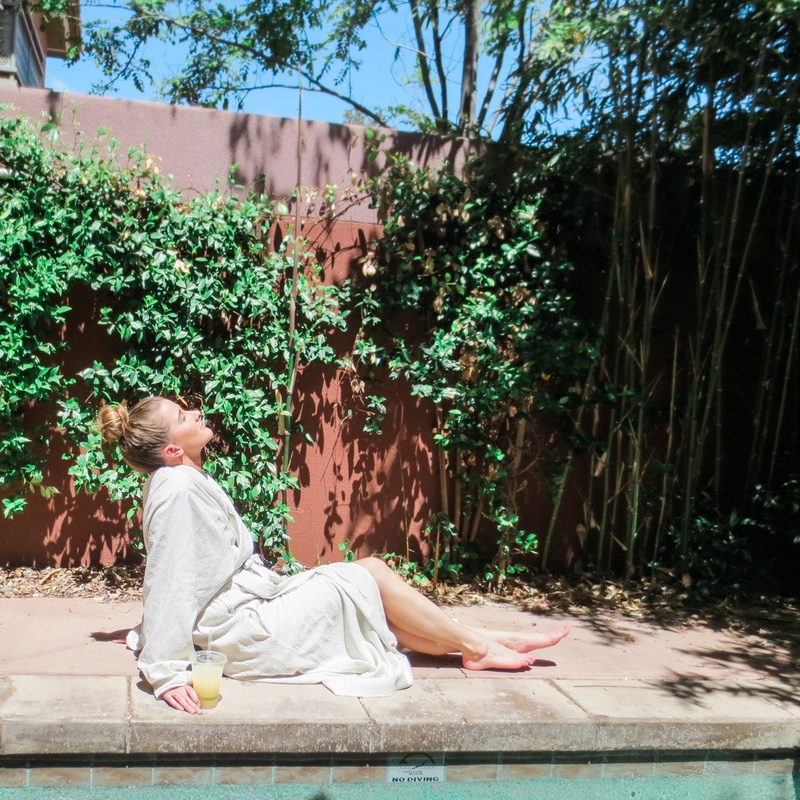 then we all lounge around in our robes, enjoying the fresh Sedona air and the serene atmosphere of this elegant spa. 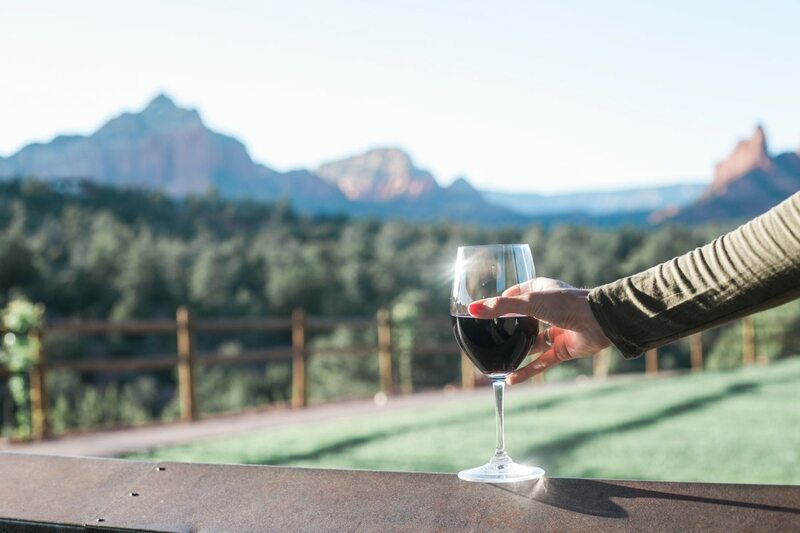 We toast one last time to our Sedona Girls Getaway before we’re all summoned for our treatments. The next 60 minutes are pure bliss: Hot stones, strong pressure, meditative tunes and the aroma of rosemary, eucalyptus and chamomile. 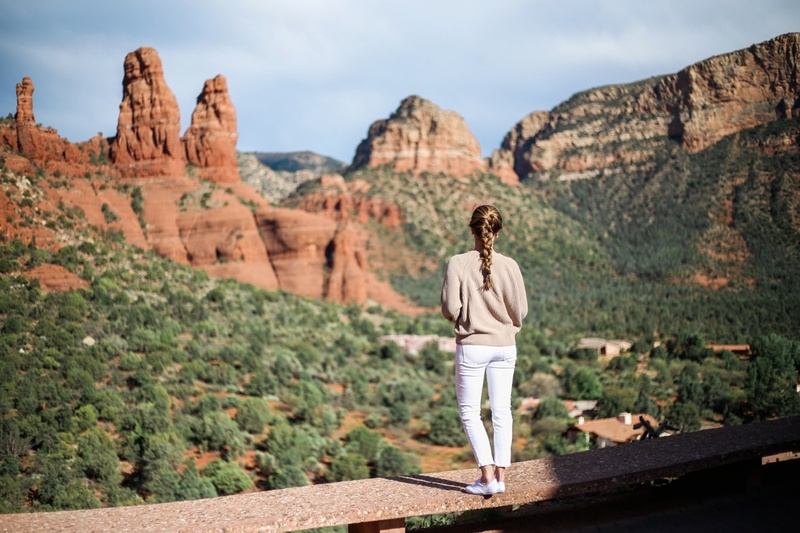 I wish I could leave you as refreshed after reading this as I am after the restorative experiences I’ve had here in Sedona… The magic, the views, the food and the booze surely make this a box to check on your USA bucket list! 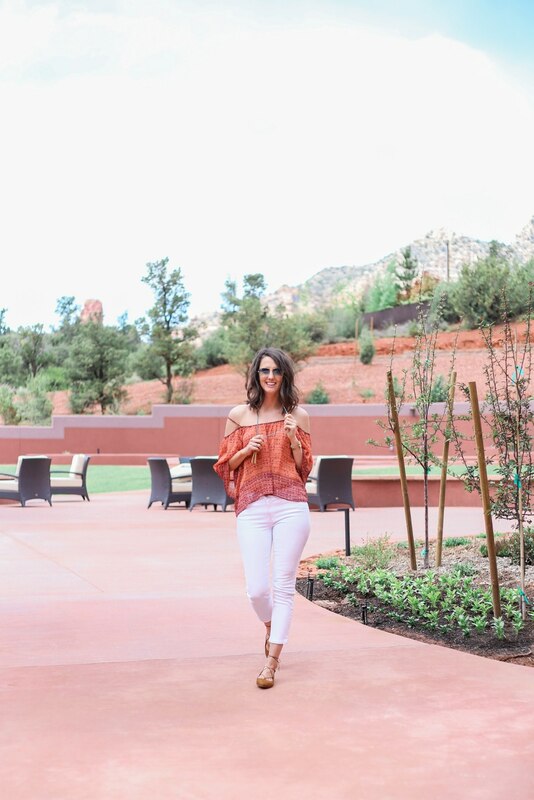 Visit Sedona, embrace the weirdness, hike the red rocks, drink the wine and indulge in the authentic food… and while you’re at it, pack me in your suitcase – I’m (already) ready to return! 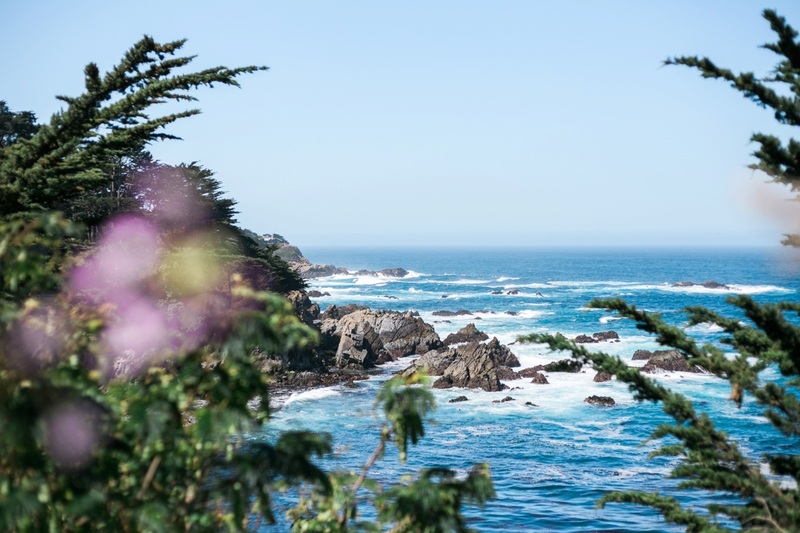 Don’t forget to read about Girls Getaway #1: San Antonio, Texas and stay tuned for my adventures in Big Sur California with Travel Part Time and Curt Pittman, up next! Are you kidding! This trip looks insane!!! Absolutely loving these photos! Thanks so much, Brianne!! It was a gorgeous trip, everywhere I turned there were stunning photo opps!! 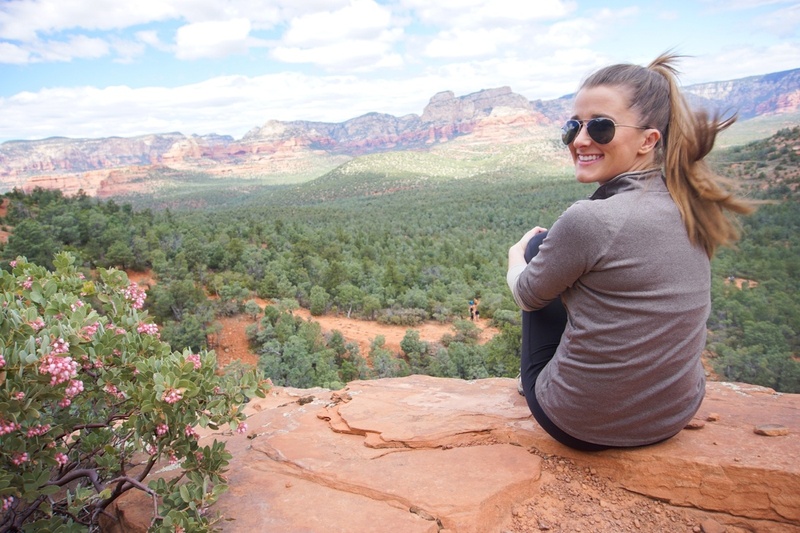 I was in Sedona this past fall and love it there! Thanks for letting me relive my trip through your post and of course, I’m ready to return! Looks like you had a spectacular time! Oh I bet it’s lovely in the fall as well!! Thanks so much for reading & reminiscing on your adventures there through our trip!! This looks so incredibly amazing, I so much want to do this with some friends!!! 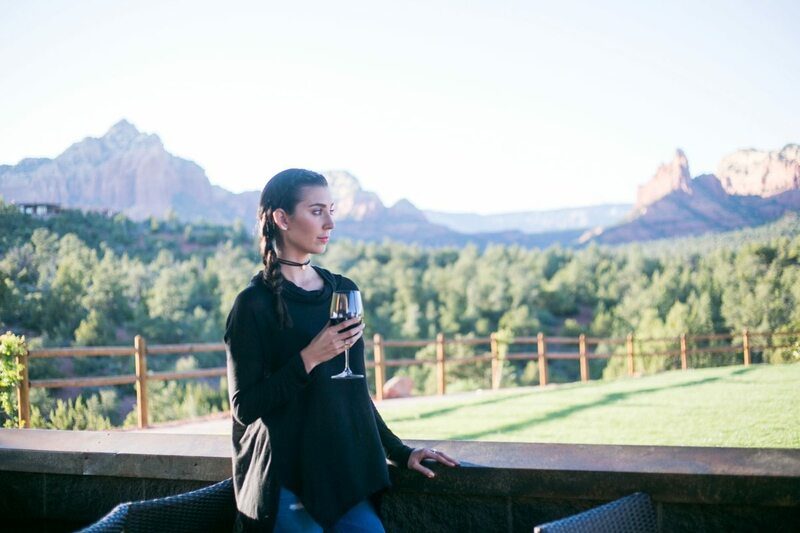 What a bucket list adventure- so sumptuous- the views, the food, the activity- these pictures make me want to book a getaway to Sedona STAT! Melissa, it really was quite the girls getaway adventure!! It was such a great weekend getaway! This trip looks amazing! Next time I am coming with you!! 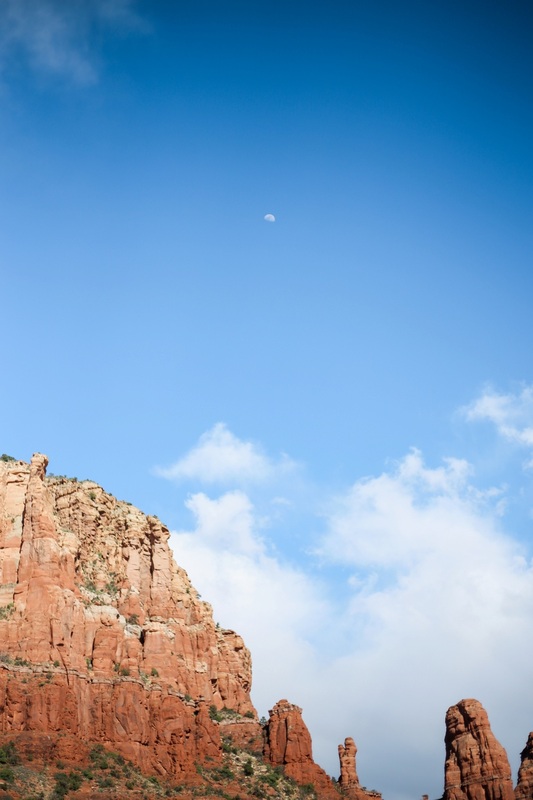 I still haven’t been to Sedona, but one day…. Yes! 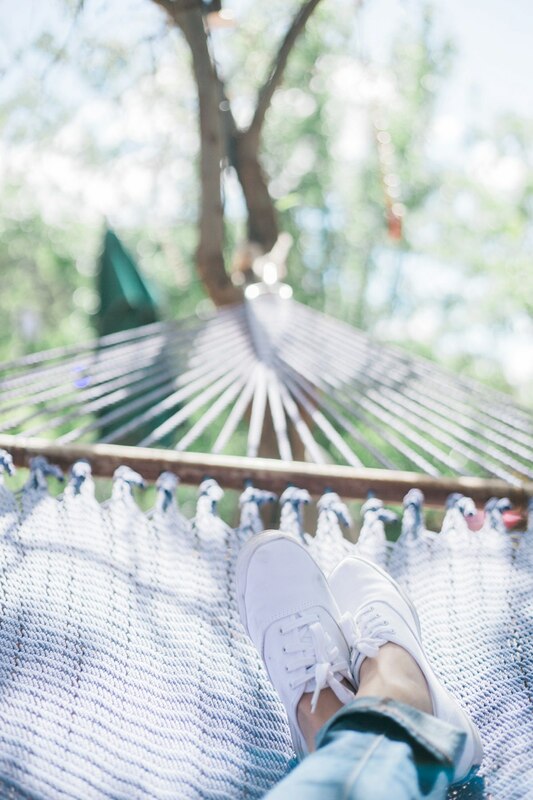 You’ll love it – fresh air, beautiful views & great food!